I imagine that many more people are in this position. Perhaps even you? 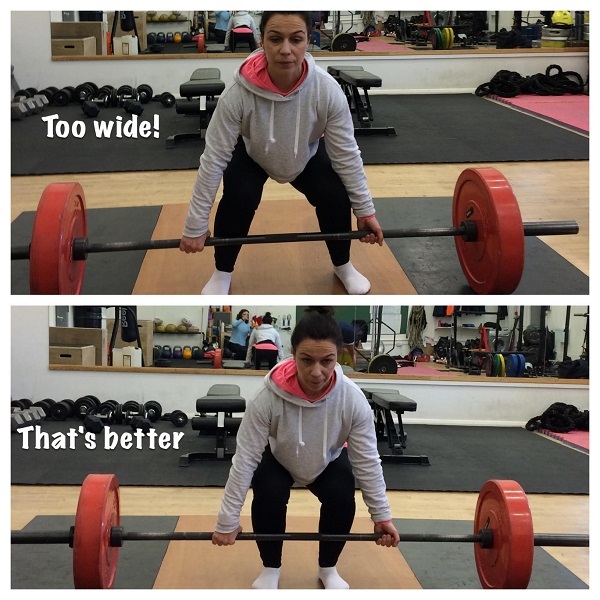 What is the ideal deadlift stance? The ideal deadlift stance for a conventional (i.e. 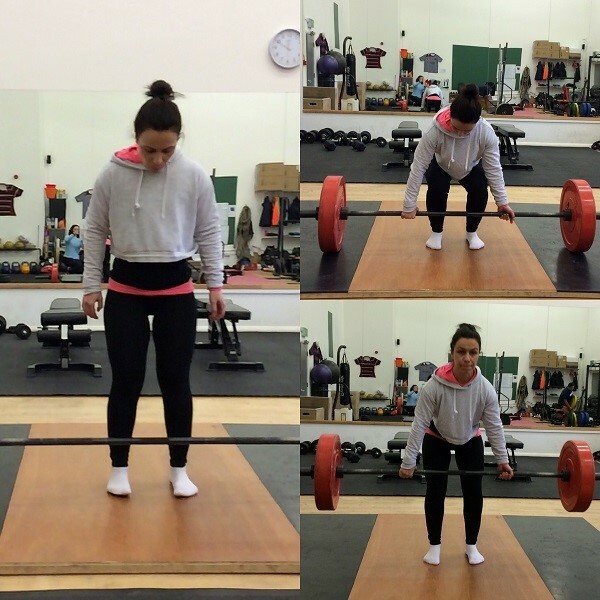 not sumo) deadlift is for the feet to be around hip-width apart, and the feet slightly turned out. Another way to find the ideal stance is to do a couple of vertical jumps as high as you can; where your feet land is where your stance should be for deadlifting. However, a lot of people are using a stance that is closer to their squat stance: shoulder-width or even wider. Compounding this is the tendency for the knees to collapse inward when the feet are too wide – as you can see happening in the top picture. The reason many people start with a wide stance is that it is easier to get down to the bar with a flat back when the stance is wide. Your arms don’t have to reach as far! But this is not the strongest mechanical position for pulling a bar from the floor. In a hip-width or vertical jump stance, all your force can bear downwards in a straight line to push against the floor. Also if your knees tend to collapse inwards when pulling heavy weights, a wide stance puts more pressure on the knee ligaments. The number one reason for people adopting a wide deadlift stance is mobility. It makes it easier to get down to the bar, especially if you are tall or have relatively long legs. What I see happening is that people’s mobility has actually improved over time, but they’ve never altered their stance since day one. Another scenario I come across regularly is that people haven’t been given the right cues to pull themselves into the correct start position with the correct stance, so they’ve always naturally adopted a wider stance. All of the above should make a significant difference – and many of you will suddenly find yourselves with a narrow stance and a nice flat back, ready to lift that weight. For those of you who still don’t have a flat back after all of that, my suggestion is to raise the bar a couple of inches off the floor, using weight plates or a small step. This will allow you to adopt the correct stance and pull from a mechanically advantageous position. Over time, re-test your position from the floor and it will gradually improve. I recently did exactly this work with a client. He is someone I only see once a month. When he came to me, he was not able to deadlift safely from the floor; both his lower back and upper back were rounded over. Even after we worked on the cues I laid out above, he was still not able to get into a safe position to lift off the floor. If this sounds like you, all is not lost! To start with, I instructed my client to do all his deadlifting from a raised height of 4 inches, so that he could train safely and get the benefits of deadlifting without screwing his back up! I also gave him the following mobility work to do, 3 times a week before every training session. These programs tackle the key areas: stretching the hamstrings, activating the glutes, mobilising the thoracic spine and strengthening the shoulder retractors. The client was diligent with his training and as a result, 6 weeks later he was deadlifting triple figures from the floor.